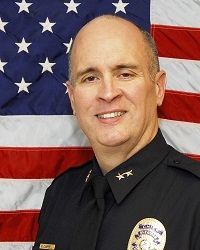 In April of 2011, Mark Campbell was appointed as the Chief of Police for the Sheridan Police Department. Prior to coming to Sheridan, Chief Campbell was employed by the Arapahoe County Sheriff’s Office. Since 1982 he has held a variety of assignments including patrol officer, canine handler, hostage negotiator, canine trainer, patrol sergeant, training sergeant, patrol lieutenant, and patrol captain. In 2002 he was appointed as the Undersheriff of the Arapahoe County Sheriff’s Office. Coincidentally, during his tenure he also served as the interim Chief of Police for the City of Sheridan. Chief Campbell is a graduate of the FBI National Academy and Northwestern University’s School of Police Staff and Command. He holds a Masters Degree in Public Administration from the University of Colorado and an Associate in Risk Management certification from the Insurance Institute of America. He is a member of numerous professional organizations including the International Association of Chiefs of Police, FBI National Academy Associates, and the Public Risk Management Association. As the Chief of the Sheridan Police Department, Chief Campbell is committed to enhancing the quality of life and the safety of the Sheridan Community.